Acute lymphoblastic leukemia (ALL) is a cancer of the lymphoid line of blood cells characterized by the development of large numbers of immature lymphocytes. Symptoms may include feeling tired, pale skin color, fever, easy bleeding or bruising, enlarged lymph nodes, or bone pain. As an acute leukemia, ALL progresses rapidly and is typically fatal within weeks or months if left untreated. Bone marrow aspirate smear from a person with precursor B-cell ALL. The large purple cells are lymphoblasts. In most cases, the cause is unknown. Genetic risk factors may include Down syndrome, Li-Fraumeni syndrome, or neurofibromatosis type 1. Environmental risk factors may include significant radiation exposure or prior chemotherapy. Evidence regarding electromagnetic fields or pesticides is unclear. Some hypothesize that an abnormal immune response to a common infection may be a trigger. The underlying mechanism involves multiple genetic mutations that results in rapid cell division. The excessive immature lymphocytes in the bone marrow interfere with the production of new red blood cells, white blood cells, and platelets. Diagnosis is typically based on blood tests and bone marrow examination. ALL is typically treated initially with chemotherapy aimed at bringing about remission. This is then followed by further chemotherapy typically over a number of years. Additional treatments may include intrathecal chemotherapy or radiation therapy if spread to the brain has occurred. Stem cell transplantation may be used if the disease recurs following standard treatment. Additional treatments such as immunotherapy are being studied. ALL affected about 876,000 people globally in 2015 and resulted in about 111,000 deaths. It occurs most commonly in children, particularly those between the ages of two and five. In the United States it is the most common cause of cancer and death from cancer among children. ALL is notable for being the first disseminated cancer to be cured. Survival for children increased from under 10% in the 1960s to 90% in 2015. Survival rates remain lower for babies (50%) and adults (35%). Initial symptoms can be nonspecific, particularly in children. Over 50% of children with leukemia had one or more of five features: a liver one can feel (64%), a spleen one can feel (61%), pale complexion (54%), fever (53%), and bruising (52%). Additionally, recurrent infections, feeling tired, arm or leg pain, and enlarged lymph nodes can be prominent features. The B symptoms, such as fever, night sweats, and weight loss, are often present as well. Central nervous system (CNS) symptoms such cranial neuropathies due to meningeal infiltration are identified in less than 10% of adults and less than 5% of children, particularly mature B-cell ALL (Burkitt leukemia) at presentation. The cancerous cell in ALL is the lymphoblast. Normal lymphoblasts develop into mature, infection-fighting B-cells or T-cells, also called lymphocytes. Signals in the body control the number of lymphocytes so neither too few nor too many are made. In ALL, both the normal development of some lymphocytes and the control over the number of lymphoid cells become defective. ALL emerges when a single lymphoblast gains many mutations to genes that affect blood cell development and proliferation. In childhood ALL, this process begins at conception with the inheritance of some of these genes. These genes, in turn, increase the risk that more mutations will occur in developing lymphoid cells. Certain genetic syndromes, like Down Syndrome, have the same effect. Environmental risk factors are also needed to help create enough genetic mutations to cause disease. Evidence for the role of the environment is seen in childhood ALL among twins, where only 10–15% of both genetically identical twins get ALL. Since they have the same genes, different environmental exposures explain why one twin gets ALL and the other does not. Infant ALL is a rare variant that occurs in babies less than one year old. KMT2A (formerly MLL) gene rearrangements are most common and occur in the embryo or fetus before birth. These rearrangements result in increased expression of blood cell development genes by promoting gene transcription and through epigenetic changes. In contrast to childhood ALL, environmental factors are not thought to play a significant role. Aside from the KMT2A rearrangement, only one extra mutation is typically found. Environmental exposures are not needed to help create more mutations. Common inherited risk factors include mutations in ARID5B, CDKN2A/2B, CEBPE, IKZF1, GATA3, PIP4K2A and, more rarely, TP53. These genes play important roles in cellular development, proliferation, and differentiation. Individually, most of these mutations are low risk for ALL. Significant risk of disease occurs when a person inherits several of these mutations together. The uneven distribution of genetic risk factors may help explain differences in disease rate among ethnic groups. For instance, the ARID5B mutation is less common in ethnic African populations. Several genetic syndrome also carry increased risk of ALL. These include: Down syndrome, Fanconi anemia, Bloom syndrome, X-linked agammaglobulinemia, severe combined immunodeficiency, Shwachman-Diamond syndrome, Kostmann syndrome, neurofibromatosis type 1, ataxia-telangiectasia, paroxysmal nocturnal hemoglobinuria, and Li-Fraumeni syndrome. Fewer than 5% of cases are associated with a known genetic syndrome. Rare mutations in ETV6 and PAX5 are associated with a familial form of ALL with autosomal dominant patterns of inheritance. The environmental exposures that contribute to emergence of ALL is contentious and a subject of ongoing debate. High levels of radiation exposure from nuclear fallout is a known risk factor for developing leukemia. Evidence whether less radiation, as from x-ray imaging during pregnancy, increases risk of disease remains inconclusive. Studies that have identified an association between x-ray imaging during pregnancy and ALL found only a slightly increased risk. Exposure to strong electromagnetic radiation from power lines has also been associated with a slightly increased risk of ALL. This result is questioned as no causal mechanism linking electromagnetic radiation with cancer is known. High birth weight (greater than 4000g or 8.8lbs) is also associated with a small increased risk. The mechanism connecting high birth weight to ALL is also not known. Evidence suggests that secondary leukemia can develop in individuals treated with certain types of chemotherapy, such as epipodophyllotoxins and cyclophosphamide. There is some evidence that a common infection, such as influenza, may indirectly promote emergence of ALL. The delayed-infection hypothesis states that ALL results from an abnormal immune response to infection in a person with genetic risk factors. Delayed development of the immune system due to limited disease exposure may result in excessive production of lymphocytes and increased mutation rate during an illness. Several studies have identified lower rates of ALL among children with greater exposure to illness early in life. Very young children who attend daycare have lower rates of ALL. Evidence from many other studies looking at disease exposure and ALL is inconclusive. Several characteristic genetic changes lead to the creation of a leukemic lymphoblast. These changes include chromosomal translocations, intrachromosomal rearrangements, changes in the number of chromosomes in leukemic cells, and additional mutations in individual genes. Chromosomal translocations involve moving a large region of DNA from one chromosome to another. This move can result in placing a gene from one chromosome that promotes cell division to a more actively transcribed area on another chromosome. The result is a cell that divides more often. An example of this includes the translocation of C-MYC, a gene that encodes a transcription factor that leads to increased cell division, next to the immunoglobulin heavy- or light-chain gene enhancers, leading to increased C-MYC expression and increased cell division. Other large changes in chromosomal structure can result in placement of two genes directly next to each other. The result is the combination of two usually separate proteins into a new fusion protein. This protein can have a new function that promotes the development of cancer. Examples of this include the ETV6-RUNX1 fusion gene that combines two factors that promote blood cell development and the BCR-ABL1 fusion gene of the Philadelphia chromosome. BCR-ABL1 encodes an always-activated tyrosine kinase that causes frequent cell division. These mutations produce a cell that divides more often, even in the absence of growth factors. Other genetic changes in B-cell ALL include changes to the number of chromosomes within the leukemic cells. Gaining at least five additional chromosomes, called high hyperdiploidy, occurs more commonly. Less often, chromosomes are lost, called hypodiploidy, which is associated with a poorer prognosis. Additional common genetic changes in B-cell ALL involve non-inherited mutations to PAX5 and IKZF1. In T-cell ALL, LYL1, TAL1, TLX1, and TLX3 rearrangements can occur. ALL results when enough of these genetic changes are present in a single lymphoblast. In childhood ALL, for example, one fusion gene translocation is often found along with six to eight other ALL-related genetic changes. 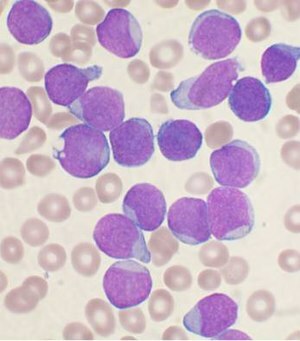 The initial leukemic lymphoblast copies itself into an excessive number of new lymphoblasts, none of which can develop into functioning lymphocytes. These lymphoblasts build up in the bone marrow and may spread to other sites in the body, such as lymph nodes, the mediastinum, the spleen, the testicles, and the brain, leading to the common symptoms of disease. Diagnosing ALL begins with a thorough medical history, physical examination, complete blood count, and blood smears. While many symptoms of ALL can be found in common illnesses, persistent or unexplained symptoms raise suspicion of cancer. Because many features on the medical history and exam are not specific to ALL, further testing is often needed. A large number of white blood cells and lymphoblasts in the circulating blood can be suspicious for ALL because they indicate a rapid production of lymphoid cells in the marrow. The higher these numbers typically points to a worse prognosis. While white blood cell counts at initial presentation can vary significantly, circulating lymphoblast cells are seen on peripheral blood smears in the majority of cases. A bone marrow biopsy provides conclusive proof of ALL, typically with >20% of all cells being leukemic lymphoblasts. A lumbar puncture (also known as a spinal tap) can determine whether the spinal column and brain have been invaded. Brain and spinal column involvement can be diagnosed either through confirmation of leukemic cells in the lumbar puncture or through clinical signs of CNS leukemia as described above. Laboratory tests that might show abnormalities include blood count, kidney function, electrolyte, and liver enzyme tests. Pathological examination, cytogenetics (in particular the presence of Philadelphia chromosome), and immunophenotyping establish whether the leukemic cells are myeloblastic (neutrophils, eosinophils, or basophils) or lymphoblastic (B lymphocytes or T lymphocytes). Cytogenetic testing on the marrow samples can help classify disease and predict how aggressive the disease course will be. Different mutations have been associated with shorter or longer survival. Immunohistochemical testing may reveal TdT or CALLA antigens on the surface of leukemic cells. TdT is a protein expressed early in the development of pre-T and pre-B cells, whereas CALLA is an antigen found in 80% of ALL cases and also in the "blast crisis" of CML. Medical imaging (such as ultrasound or CT scanning) can find invasion of other organs commonly the lung, liver, spleen, lymph nodes, brain, kidneys, and reproductive organs. In addition to cell morphology and cytogenetics, immunophenotyping, a laboratory technique used to identify proteins that are expressed on their cell surface, is a key component in the diagnosis of ALL. The preferred method of immunophenotyping is through flow cytometry. In the malignant lymphoblasts of ALL, expression of terminal deoxynucleotidyl transferase (TdT) on the cell surface can help differentiate malignant lymphocyte cells from reactive lymphocytes, white blood cells that are reacting normally to an infection in the body. On the other hand, myeloperoxidase (MPO), a marker for the myeloid lineage, is typically not expressed. Because precursor B cell and precursor T cells look the same, immunophenotyping can help differentiate the subtype of ALL and the level of maturity of the malignant white blood cells. The subtypes of ALL as determined by immunophenotype and according to the stages of maturation. An extensive panel of monoclonal antibodies to cell surface markers, particularly CD or cluster of differentiation markers, are used to classify cells by lineage. Below are immunological markers associated with B cell and T cell ALL. Cytogenetic analysis has shown different proportions and frequencies of genetic abnormalities in cases of ALL from different age groups. This information is particularly valuable for classification and can in part explain different prognosis of these groups. In regards to genetic analysis, cases can be stratified according to ploidy, number of sets of chromosomes in the cell, and specific genetic abnormalities, such as translocations. Hyperdiploid cells are defined as cells with more than 50 chromosomes, while hypodiploid is defined as cells with less than 44 choromosomes. Hyperdiploid cases tend to carry good prognosis while hypodiploid cases do not. For example, the most common specific abnormality in childhood B-ALL is the t(12;21) ETV6-RUNX1 translocation, in which the RUNX1 gene, encoding a protein involved in transcriptional control of hemopoiesis, has been translocated and repressed by the ETV6-RUNX1 fusion protein. Below is a table with the frequencies of some cytogenetic translocations and molecular genetic abnormalities in ALL. Historically, prior to 2008, ALL was classified morphologically using the French-American-British (FAB) system that heavily relied on morphological assessment. The FAB system takes into account information on size, cytoplasm, nucleoli, basophilia (color of cytoplasm), and vacuolation (bubble-like properties). In 2008, the World Health Organization classification of acute lymphoblastic leukemia was developed in an attempt to create a classification system that was more clinically relevant and could produce meaningful prognostic and treatment decisions. This system recognized differences in genetic, immunophenotype, molecular, and morphological features found through cytogenetic and molecular diagnostics tests. :1531–1535 This subtyping helps determine the prognosis and the most appropriate treatment for each specific case of ALL. The aim of treatment is to induce a lasting remission, defined as the absence of detectable cancer cells in the body (usually less than 5% blast cells in the bone marrow). Over the past several decades, there have been strides to increase the efficacy of treatment regimens, resulting in increased survival rates. Possible treatments for acute leukemia include chemotherapy, steroids, radiation therapy, intensive combined treatments (including bone marrow or stem cell transplants), and/or growth factors. Chemotherapy is the initial treatment of choice, and most ALL patients receive a combination of medications. There are no surgical options because of the body-wide distribution of the malignant cells. In general, cytotoxic chemotherapy for ALL combines multiple antileukemic drugs tailored to each patient. Chemotherapy for ALL consists of three phases: remission induction, intensification, and maintenance therapy. Induce absence of other signs and symptoms of the disease. In Philadelphia chromosome-positive ALL, the intensity of initial induction treatment may be less than has been traditionally given. Central nervous system relapse is treated with intrathecal administration of hydrocortisone, methotrexate, and cytarabine. Due to presence of CNS involvement in 10–40% of adult patients at diagnosis, most providers start Central nervous system (CNS) prophylaxis and treatment during the induction phase, and continue it during the consolidation/intensification period. Adult chemotherapy regimens mimic those of childhood ALL; however, are linked with a higher risk of disease relapse with chemotherapy alone. It should be known that 2 subtypes of ALL (B-cell ALL and T-cell ALL) require special considerations when it comes to selecting an appropriate treatment regimen in adult patients. B-cell ALL is often associated with cytogenetic abnormalities (specifically, t(8;14), t (2;8) and t(8;22)), which require aggressive therapy consisting of brief, high-intensity regimens. T-cell ALL responds to cyclophosphamide-containing agents the most. As the chemotherapy regimens can be intensive and protracted, many patients have an intravenous catheter inserted into a large vein (termed a central venous catheter or a Hickman line), or a Portacath, usually placed near the collar bone, for lower infection risks and the long-term viability of the device. Males usually endure a longer course of treatment than females as the testicles can act as a reservoir for the cancer. Radiation therapy (or radiotherapy) is used on painful bony areas, in high disease burdens, or as part of the preparations for a bone marrow transplant (total body irradiation). In the past, physicians commonly utilized radiation in the form of whole-brain radiation for central nervous system prophylaxis, to prevent occurrence and/or recurrence of leukemia in the brain. Recent studies showed that CNS chemotherapy provided results as favorable but with less developmental side-effects. As a result, the use of whole-brain radiation has been more limited. Most specialists in adult leukemia have abandoned the use of radiation therapy for CNS prophylaxis, instead using intrathecal chemotherapy. Selection of biological targets on the basis of their combinatorial effects on the leukemic lymphoblasts can lead to clinical trials for improvement in the effects of ALL treatment. Tyrosine-kinase inhibitors (TKIs), such as imatinib, are often incorporated into the treatment plan for patients with Bcr-Abl1+ (Ph+) ALL. However, this subtype of ALL is frequently resistant to the combination of chemotherapy and TKIs and allogeneic stem cell transplantation is often recommended upon relapse. Blinatumomab, a CD19-CD3 bi-specific monoclonal murine antibody, currently shows promise as a novel pharmacotherapy. By engaging the CD3 T-cell with the CD19 receptor on B cells, it triggers a response to induce the release of inflammatory cytokines, cytotoxic proteins and proliferation of T cells to kill CD19 B cells. Chimeric antigen receptors (CARs) have been developed as a promising immunotherapy for ALL. This technology uses a single chain variable fragment (scFv) designed to recognize the cell surface marker CD19 as a method of treating ALL. CD19 is a molecule found on all B-cells and can be used as a means of distinguishing the potentially malignant B-cell population. In this therapy, mice are immunized with the CD19 antigen and produce anti-CD19 antibodies. Hybridomas developed from mouse spleen cells fused to a myeloma cell line can be developed as a source for the cDNA encoding the CD19 specific antibody. The cDNA is sequenced and the sequence encoding the variable heavy and variable light chains of these antibodies are cloned together using a small peptide linker. This resulting sequence encodes the scFv. This can be cloned into a transgene, encoding what will become the endodomain of the CAR. Varying arrangements of subunits serve as the endodomain, but they generally consist of the hinge region that attaches to the scFv, a transmembrane region, the intracellular region of a costimulatory molecule such as CD28, and the intracellular domain of CD3-zeta containing ITAM repeats. Other sequences frequently included are: 4-1bb and OX40. The final transgene sequence, containing the scFv and endodomain sequences is then inserted into immune effector cells that are obtained from the patient and expanded in vitro. In trials these have been a type of T-cell capable of cytotoxicity. Inserting the DNA into the effector cell can be accomplished by several methods. Most commonly, this is done using a lentivirus that encodes the transgene. Pseudotyped, self-inactivating lentiviruses are an effective method for the stable insertion of a desired transgene into the target cell. Other methods include electroporation and transfection, but these are limited in their efficacy as transgene expression diminishes over time. The gene-modified effector cells are then transplanted back into the patient. Typically this process is done in conjunction with a conditioning regimen such as cyclophosphamide, which has been shown to potentiate the effects of infused T-cells. This effect has been attributed to making an immunologic space within which the cells populate. The process as a whole results in an effector cell, typically a T-cell, that can recognize a tumor cell antigen in a manner that is independent of the major histocompatibility complex and which can initiate a cytotoxic response. In 2017 tisagenlecleucel was approved by the FDA as a CAR-T therapy for acute B-cell lymphoblastic leukaemia patients who did not respond adequately to other treatments or have relapsed. In a 22-day process, the "drug" is customized for each patient. T cells purified from each patient are modified by a virus that inserts genes that encode a chimaeric antigen receptor into their DNA, one that recognizes leukemia cells. Typically, people who experience a relapse in their ALL after initial treatment have a poorer prognosis than those who remain in complete remission after induction therapy. It is unlikely that the recurrent leukemia will respond favorably to the standard chemotherapy regimen that was initially implemented, and instead these patients should be trialed on reinduction chemotherapy followed by allogeniec bone marrow transplantation. These patients in relapse may also receive blinatumomab, as it has shown to increase remission rates and overall survival rates, without increased toxic effects. Low dose palliative radiation may also help reduce the burden of tumor inside or outside the central nervous system and alleviate some symptoms. Recently, there has also been evidence and approval of use for dasatinib, a tyrosine kinase inhibitor. It has shown efficacy in cases of patients with Ph1-positive and imatinib-resistant ALL, but more research needs to be done on long term survival and time to relapse. Prior to the development of chemotherapy regimens and hematopoietic stem cell transplant, children were surviving a median length of 3 months, largely due to either infection or bleeding. Since the advent of chemotherapy, prognosis for childhood leukemia has improved greatly and children with ALL are estimated to have a 95% probability of achieving a successful remission after 4 weeks of initiating treatment. Pediatric patients with ALL in developed countries have a greater than 80% five-year-survival rate. It is estimated that 60–80% of adults undergoing induction chemotherapy achieve complete remission after 4 weeks, and those over the age of 70 have a cure rate of 5%. Gender: Females tend to fare better than males. Ethnicity: Caucasians are more likely to develop acute leukemia than African-Americans, Asians, or Hispanics. However, they also tend to have a better prognosis than non-Caucasians. Age at diagnosis: children 1–10 years of age are most likely to develop ALL and to be cured of it. Cases in older patients are more likely to result from chromosomal abnormalities (e.g., the Philadelphia chromosome) that make treatment more difficult and prognoses poorer. Older patients are also likely to have co-morbid medical conditions that make it even more difficult to tolerate ALL treatment. Cancer spreading into the Central nervous system (brain or spinal cord) has worse outcomes. Patients with t(9,22) positive-ALL (30% of adult ALL cases) and other Bcr-abl-rearranged leukemias are more likely to have a poor prognosis, but survival rates may rise with treatment consisting of chemotherapy and Bcr-abl tyrosine kinase inhibitors. A translocation between chromosomes 4 and 11 occurs in about 4% of cases and is most common in infants under 12 months. Hyperdiploidy (>50 chromosomes) and t(12;21) are good prognostic factors and also make up 50% of pediatric ALL cases. Unclassified ALL is considered to have an intermediate prognosis risk, somewhere in-between the good and poor risk categories. Acute lymphoblastic leukemia affected about 876,000 people and resulted in 111,000 deaths globally in 2015. It occurs in both children and adults with highest rates seen between the ages three and seven years. Around 75% of cases occur before the age of 6 with a secondary rise after the age of 40. It is estimated to affect 1 in 1500 children. Accounting for the broad age profiles of those affected, ALL newly occurs in about 1.7 per 100,000 people per year. ALL represents approximately 20% of adult and 80% of childhood leukemias, making it the most common childhood cancer. Although 80 to 90% of children will have a long term complete response with treatment,:1527 it remains the leading cause of cancer-related deaths among children. 85% of cases are of B-cell lineage and have equal incidences in both males and females. The remaining 15% of T-cell lineage have a male predominance. Globally ALL, typically occurs more often in Caucasians, Hispanics, and Latin Americans than in Africans. :1617 In the US, ALL is more common in children from Caucasian (36 cases/million) and Hispanic (41 cases/million) descent when compared to those from African (15 cases/million) descent. Leukemia is rarely associated with pregnancy, affecting only about 1 in 10,000 pregnant women. The management of leukemia in a pregnant patient depends primarily on the type of leukemia. Acute leukemias normally require prompt, aggressive treatment, despite significant risks of pregnancy loss and birth defects, especially if chemotherapy is given during the developmentally sensitive first trimester. ^ a b c d e f g h "Childhood Acute Lymphoblastic Leukemia Treatment". National Cancer Institute. 8 December 2017. Retrieved 20 December 2017. ^ a b c d e f g h i j k l m n o p q r s Hunger, Stephen P.; Mullighan, Charles G. (14 October 2015). "Acute Lymphoblastic Leukemia in Children". New England Journal of Medicine. 373 (16): 1541–1552. doi:10.1056/nejmra1400972. PMID 26465987. ^ a b c d Ferri, Fred F. (2017). Ferri's Clinical Advisor 2018 E-Book: 5 Books in 1. Elsevier Health Sciences. p. 743. ISBN 9780323529570. ^ a b c d e f g h i j k l m n o p q r s Inaba H, Greaves M, Mullighan CG (June 2013). "Acute lymphoblastic leukaemia". Lancet. 381 (9881): 1943–55. doi:10.1016/S0140-6736(12)62187-4. PMC 3816716. PMID 23523389. ^ a b c d e f Baljevic, Muhamed; Jabbour, Elias; O'Brien, Susan; Kantarjian, Hagop M (2016). "Acute Lymphoblastic Leukemia". In Kantarjian, HM; Wolff, RA (eds.). The MD Anderson Manual of Medical Oncology (3 ed.). New York: McGraw-Hill Education. Retrieved 22 November 2017. ^ a b c Paul, Shilpa; Kantarjian, Hagop; Jabbour, Elias J. (2016). "Adult Acute Lymphoblastic Leukemia". Mayo Clinic Proceedings. 91 (11): 1645–1666. doi:10.1016/j.mayocp.2016.09.010. PMID 27814839. ^ a b Boer, JM; den Boer, ML (11 July 2017). "BCR-ABL1-like acute lymphoblastic leukaemia: From bench to bedside". European Journal of Cancer. 82: 203–218. doi:10.1016/j.ejca.2017.06.012. PMID 28709134. ^ "Acute Lymphocytic Leukemia - Cancer Stat Facts". SEER. Retrieved 20 December 2017. ^ a b Tubergen, DG; Bleyer, A; Ritchey, AK (2011). "Acute Lymphoblastic Leukemia". In Kliegman, RM; Stanton, BMD; St Geme, J; Schor, NF; Behrman, RE (eds.). Nelson Textbook of Pediatrics (19th ed.). Philadelphia, PA: Elsevier/Saunders. pp. 1732–1737. ISBN 978-1437707557. OCLC 706780860. ^ Brown, Patrick (6 December 2013). "Treatment of infant leukemias: challenge and promise". ASH Education Program Book. 2013 (1): 596–600. doi:10.1182/asheducation-2013.1.596. ISSN 1520-4391. PMC 4729208. PMID 24319237. ^ Clarke, Rachel T.; Bruel, Ann Van den; Bankhead, Clare; Mitchell, Christopher D.; Phillips, Bob; Thompson, Matthew J. (1 October 2016). "Clinical presentation of childhood leukaemia: a systematic review and meta-analysis". Archives of Disease in Childhood. 101 (10): 894–901. doi:10.1136/archdischild-2016-311251. ISSN 0003-9888. PMID 27647842. ^ Cortes, J. (February 2001). "Central nervous system involvement in adult acute lymphocytic leukemia". Hematology/Oncology Clinics of North America. 15 (1): 145–162. doi:10.1016/s0889-8588(05)70203-3. ISSN 0889-8588. PMID 11253605. ^ a b c Seiter, K (5 February 2014). Sarkodee-Adoo, C; Talavera, F; Sacher, RA; Besa, EC (eds.). "Acute Lymphoblastic Leukemia". Medscape Reference. WebMD. Archived from the original on 18 April 2014. Retrieved 17 April 2014. ^ Bleyer, W. A. (August 1988). "Central nervous system leukemia". Pediatric Clinics of North America. 35 (4): 789–814. doi:10.1016/s0031-3955(16)36510-5. ISSN 0031-3955. PMID 3047654. ^ Ingram, L. C.; Fairclough, D. L.; Furman, W. L.; Sandlund, J. T.; Kun, L. E.; Rivera, G. K.; Pui, C. H. (1 May 1991). "Cranial nerve palsy in childhood acute lymphoblastic leukemia and non-Hodgkin's lymphoma". Cancer. 67 (9): 2262–2268. doi:10.1002/1097-0142(19910501)67:9<2262::aid-cncr2820670909>3.0.co;2-u. ISSN 0008-543X. PMID 2013032. ^ Terwilliger, T; Abdul-Hay, M (June 2017). "Acute lymphoblastic leukemia: a comprehensive review and 2017 update". Blood Cancer Journal. 7 (6): e577. doi:10.1038/bcj.2017.53. ISSN 2044-5385. PMC 5520400. PMID 28665419. ^ Meyer, C; Hofmann, J; Burmeister, T; Gröger, D; Park, T S; Emerenciano, M; Oliveira, M Pombo de; Renneville, A; Villarese, P (2013). "The MLL recombinome of acute leukemias in 2013". Leukemia. 27 (11): 2165–2176. doi:10.1038/leu.2013.135. ISSN 1476-5551. PMC 3826032. PMID 23628958. ^ Benedikt, A; Baltruschat, S; Scholz, B; Bursen, A; Arrey, T N; Meyer, B; Varagnolo, L; Müller, A M; Karas, M (2011). "The leukemogenic AF4–MLL fusion protein causes P-TEFb kinase activation and altered epigenetic signatures". Leukemia. 25 (1): 135–144. doi:10.1038/leu.2010.249. ISSN 1476-5551. PMID 21030982. ^ Preston, D. L.; Kusumi, S.; Tomonaga, M.; Izumi, S.; Ron, E.; Kuramoto, A.; Kamada, N.; Dohy, H.; Matsuo, T. (1 February 1994). "Cancer incidence in atomic bomb survivors. Part III. Leukemia, lymphoma and multiple myeloma, 1950–1987". Radiation Research. 137 (2 Suppl): S68–97. doi:10.2307/3578893. ISSN 0033-7587. JSTOR 3578893. PMID 8127953. ^ Smith MA, Rubinstein L, Anderson JR, et al. (February 1999). "Secondary Leukemia or Myelodysplastic Syndrome After Treatment With Epipodophyllotoxins" (PDF). Journal of Clinical Oncology. 17 (2): 569–77. doi:10.1200/JCO.1999.17.2.569. PMID 10080601. Archived from the original on 22 August 2009. ^ Collier, J.A.B (1991). Oxford Handbook of Clinical Specialties, Third Edition. Oxford. p. 810. ISBN 978-0-19-262116-0. ^ Longo, D (2011). "Chapter 110: Malignancies of Lymphoid Cells". Harrison's Principles of Internal Medicine (18 ed.). New York: McGraw-Hill Professional. ISBN 978-0-07-174889-6. ^ Rytting, ME, ed. (November 2013). "Acute Leukemia". Merck Manual Professional. Merck Sharp & Dohme Corp. Archived from the original on 15 July 2014. Retrieved 17 April 2014. ^ a b c V., Hoffbrand, A. (6 October 2015). Hoffbrand's essential haematology. Moss, P. A. H. (Seventh ed.). Chichester, West Sussex. ISBN 9781118408636. OCLC 910009732. ^ Bhojwani, Deepa; Pei, Deqing; Sandlund, John T.; Jeha, Sima; Ribeiro, Raul C.; Rubnitz, Jeffrey E.; Raimondi, Susana C.; Shurtleff, Sheila; Onciu, Mihaela (February 2012). "ETV6-RUNX1-positive childhood acute lymphoblastic leukemia: improved outcome with contemporary therapy". Leukemia. 26 (2): 265–270. doi:10.1038/leu.2011.227. ISSN 0887-6924. PMC 3345278. PMID 21869842. ^ Stams WA, den Boer ML, Beverloo HB, Meijerink JP, van Wering ER, Janka-Schaub GE, Pieters R (April 2005). "Expression levels of TEL, AML1, and the fusion products TEL-AML1 and AML1-TEL versus drug sensitivity and clinical outcome in t(12;21)-positive pediatric acute lymphoblastic leukemia". Clin. Cancer Res. 11 (8): 2974–80. doi:10.1158/1078-0432.CCR-04-1829. PMID 15837750. ^ a b c d Pakakasama S, Kajanachumpol S, Kanjanapongkul S, et al. (August 2008). "Simple multiplex RT-PCR for identifying common fusion transcripts in childhood acute leukemia". Int J Lab Hematol. 30 (4): 286–91. doi:10.1111/j.1751-553X.2007.00954.x. PMID 18665825. ^ McWhirter JR, Neuteboom ST, Wancewicz EV, et al. (September 1999). "Oncogenic homeodomain transcription factor E2A-Pbx1 activates a novel WNT gene in pre-B acute lymphoblastoid leukemia". Proc. Natl. Acad. Sci. U.S.A. 96 (20): 11464–9. doi:10.1073/pnas.96.20.11464. PMC 18056. PMID 10500199. ^ Rudolph C, Hegazy AN, von Neuhoff N, et al. (August 2005). "Cytogenetic characterization of a BCR-ABL transduced mouse cell line". Cancer Genet. Cytogenet. 161 (1): 51–6. doi:10.1016/j.cancergencyto.2004.12.021. PMID 16080957. ^ Caslini C, Serna A, Rossi V, et al. (June 2004). "Modulation of cell cycle by graded expression of MLL-AF4 fusion oncoprotein". Leukemia. 18 (6): 1064–71. doi:10.1038/sj.leu.2403321. PMID 14990976. ^ Martín-Subero JI, Odero MD, Hernandez R, Cigudosa JC, Agirre X, Saez B, Sanz-García E, Ardanaz MT, Novo FJ, Gascoyne RD, Calasanz MJ, Siebert R (August 2005). "Amplification of IGH/MYC fusion in clinically aggressive IGH/BCL2-positive germinal center B-cell lymphomas". Genes Chromosomes Cancer. 43 (4): 414–23. doi:10.1002/gcc.20187. PMID 15852472. ^ Zalcberg IQ, Silva ML, Abdelhay E, et al. (October 1995). "Translocation 11;14 in three children with acute lymphoblastic leukemia of T-cell origin". Cancer Genet. Cytogenet. 84 (1): 32–8. doi:10.1016/0165-4608(95)00062-3. PMID 7497440. ^ Bennett, J. M.; Catovsky, D.; Daniel, M. T.; Flandrin, G.; Galton, D. A.; Gralnick, H. R.; Sultan, C. (August 1976). "Proposals for the classification of the acute leukaemias. French-American-British (FAB) co-operative group". British Journal of Haematology. 33 (4): 451–458. doi:10.1111/j.1365-2141.1976.tb03563.x. ISSN 0007-1048. PMID 188440. ^ "ACS :: How Is Acute Lymphocytic Leukemia Classified?". Archived from the original on 23 March 2008. ^ a b Orkin, S. H.; Nathan, D. G.; Ginsburg, D.; et al. (2014). Nathan and Oski's Hematology and Oncology of Infancy and Childhood (8th ed.). Saunders. ISBN 978-1-4557-5414-4. ^ Arber, Daniel A.; Orazi, Attilio; Hasserjian, Robert; Thiele, Jürgen; Borowitz, Michael J.; Beau, Michelle M. Le; Bloomfield, Clara D.; Cazzola, Mario; Vardiman, James W. (19 May 2016). "The 2016 revision to the World Health Organization classification of myeloid neoplasms and acute leukemia". Blood. 127 (20): 2391–2405. doi:10.1182/blood-2016-03-643544. ISSN 0006-4971. PMID 27069254. ^ "Acute lymphoblastic leukemia (ALL) Information – Mount Sinai – New York". Mount Sinai Health System. Archived from the original on 3 August 2016. Retrieved 18 November 2017. ^ a b c d Hoffbrand, Victor; Moss, Paul; Pettit, John (31 October 2006). Essential Haematology. Wiley. pp. 192–196. ISBN 978-1-4051-3649-5. Archived from the original on 21 March 2015. Retrieved 14 September 2013. ^ a b c d e f "Adult Acute Lymphoblastic Leukemia Treatment". National Cancer Institute. Retrieved 6 December 2017. ^ Jabbour E, Thomas D, Cortes J, et al. (15 May 2010). "Central nervous system prophylaxis in adults with acute lymphoblastic leukemia: current and emerging therapies". Cancer. 116 (10): 2290–300. doi:10.1002/cncr.25008. PMID 20209620. ^ M. Yanada (2015). "Time to tune the treatment of Ph+ ALL". Blood. 125 (24): 3674–5. doi:10.1182/blood-2015-04-641704. PMID 26069331. ^ a b V., Hoffbrand, A. (26 October 2015). Hoffbrand's essential haematology. Moss, P. A. H. (Seventh ed.). Chichester, West Sussex. ISBN 9781118408674. OCLC 909538759. ^ a b Paul, Shilpa; Kantarjian, Hagop; Jabbour, Elias J. (2016). "Adult Acute Lymphoblastic Leukemia". Mayo Clinic Proceedings. 91 (11): 1645–1666. doi:10.1016/j.mayocp.2016.09.010. PMID 27814839. ^ Lambrou GI, Papadimitriou L, Chrousos GP, Vlahopoulos SA (January 2012). "Glucocorticoid and proteasome inhibitor impact on the leukemic lymphoblast: multiple, diverse signals converging on a few key downstream regulators". Mol Cell Endocrinol. 351 (2): 142–51. doi:10.1016/j.mce.2012.01.003. PMID 22273806. ^ Grupp SA, Kalos M, Barrett D, et al. (2013). "Chimeric antigen receptor-modified T cells for acute lymphoid leukemia". N. Engl. J. Med. 368 (16): 1509–18. doi:10.1056/NEJMoa1215134. PMC 4058440. PMID 23527958. ^ a b Barrett DM, Singh N, Porter DL, et al. (2014). "Chimeric antigen receptor therapy for cancer". Annu. Rev. Med. 65: 333–47. doi:10.1146/annurev-med-060512-150254. PMC 4120077. PMID 24274181. ^ Alonso-Camino V, Sánchez-Martín D, Compte M, et al. (2013). "CARbodies: Human Antibodies Against Cell Surface Tumor Antigens Selected From Repertoires Displayed on T Cell Chimeric Antigen Receptors". Mol Ther Nucleic Acids. 2: e93. doi:10.1038/mtna.2013.19. PMC 4817937. PMID 23695536. ^ Zufferey R, Dull T, Mandel RJ, et al. (1998). "Self-inactivating lentivirus vector for safe and efficient in vivo gene delivery". J. Virol. 72 (12): 9873–80. PMC 110499. PMID 9811723. ^ Commissioner, Office of the. "Press Announcements—FDA approval brings first gene therapy to the United States". www.fda.gov. Archived from the original on 3 September 2017. Retrieved 12 September 2017. ^ Ledford, Heidi (12 July 2017). "Engineered cell therapy for cancer gets thumbs up from FDA advisers". Nature. 547 (7663): 270. doi:10.1038/nature.2017.22304. PMID 28726836. ^ Kantarjian, Hagop; Stein, Anthony; Gökbuget, Nicola; Fielding, Adele K.; Schuh, Andre C.; Ribera, Josep-Maria; Wei, Andrew; Dombret, Hervé; Foà, Robin (1 March 2017). "Blinatumomab versus Chemotherapy for Advanced Acute Lymphoblastic Leukemia". New England Journal of Medicine. 376 (9): 836–847. doi:10.1056/nejmoa1609783. PMC 5881572. PMID 28249141. ^ Hutter, John J. (1 June 2010). "Childhood Leukemia". Pediatrics in Review. 31 (6): 234–241. doi:10.1542/pir.31-6-234. ISSN 0191-9601. PMID 20516235. ^ "Prognosis and survival for acute lymphocytic leukemia - Canadian Cance". www.cancer.ca. Retrieved 6 December 2017. ^ V., Hoffbrand, A. (26 October 2015). Hoffbrand's essential haematology. Moss, P. A. H. (Seventh ed.). Chichester, West Sussex. p. 194. ISBN 9781118408674. OCLC 909538759. ^ Moorman AV, Harrison CJ, Buck GA, et al. (15 April 2007). "Karyotype is an independent prognostic factor in adult acute lymphoblastic leukemia (ALL): analysis of cytogenetic data from patients treated on the Medical Research Council (MRC) UKALLXII/Eastern Cooperative Oncology Group (ECOG) 2993 trial". Blood. 109 (8): 3189–3197. doi:10.1182/blood-2006-10-051912. PMID 17170120. ^ Den Boer ML, van Slegtenhorst M, De Menezes RX, et al. (January 2009). "A subtype of childhood acute lymphoblastic leukaemia with poor treatment outcome: a genome-wide classification study". Lancet Oncol. 10 (2): 125–34. doi:10.1016/S1470-2045(08)70339-5. PMC 2707020. PMID 19138562. ^ Guo LM, Xi JS, Ma Y, et al. (2014). "ARID5B gene rs10821936 polymorphism is associated with childhood acute lymphoblastic leukemia: a meta-analysis based on 39,116 subjects". Tumour Biol. 35 (1): 709–13. doi:10.1007/s13277-013-1097-0. PMID 23975371. ^ Greer, J. P.; Arber, D. A.; Glader, B.; et al. (2013). Wintrobe's Clinical Hematology (13th ed.). Lippincott Williams & Wilkins. ISBN 978-1-4511-7268-3. ^ K. Y. Urayama; A. Manabe (2014). "Genomic evaluations of childhood acute lymphoblastic leukemia susceptibility across race/ethnicities". Rinsho Ketsueki. 55 (10): 2242–8. PMID 25297793. ^ Ries, LAG; Smith, MA; Gurney, JG; Linet, M; Tamra, T; Young, JL; Bunin, GR (1999). Cancer Incidence and Survival among Children and Adolescents: United States SEER Program 1975-1995. Bethesda, MD: National Cancer Institute, SEER Program.